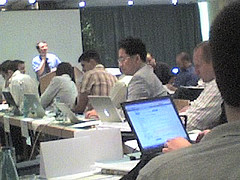 I just arrived at the Global Christian Internet Alliance meeting in Berlin. About 50-60 people here and we are listening to Dr Wolfgang Stock talking about the possibilities of the internet and the limitations of written text. Christians are well positioned in this new era, he is arguing. Good number of countries represented here – quite a few Asians. I see Lee Behar from Maclellan. I dont recognize any faces but some of the names on the list I know from emails and blogs. – John LaRue of Christianity Today showed the huge extent of CT’s reach. Keith Stonehocker and Harold Smith are also here (and their wives). I had lunch with Harold who is the new CEO and editor in chief. Sorry . . . did I just NAME_DROP???? I hate it when bloggers do that. Also enjoyed hearing about TopChretien.com in France from Eric who i have heard about but never met. They have a good stategy for both impacting lives AND making some money to help it along. Also heard from CINA in Germany, Jesus.de, CBS.co.kr in Korea, Arturo from DesarrolloCristiano in Costa Rica, and Weston Lemos gave a cool visual presentation about Lideranca.org in Brazil. Hearing now from Anders from Kommunion.no in Norway and then its Per-Mattais of Dagen.se and then, Dmitry will talk about JesusChrist.ru and Interbible in Russia . Did I already tell you that I had LUNCH with Christianity Today’s CEO HAROLD SMITH????? Is that THE Harold Smith? The CEO of Christianity Today? The one you had lunch with…personally? yeah . . . didnt you know????? maybe you didnt hear me say that I HAD LUNCH WITH THE HAROLD SMITH of above noted fame. That was the biggest name drop I have ever heard. yes – go to the various days and click on the links. Previous Post (p)	Wikiklesia: The world's first self-perpetuating nomadic business model?